Recently we were approached by a customer who used to use BCM, and wanted a solution that worked with Office 365. At the time the customer contacted us, they had not used BCM for many months. So the BCM database was out of date. 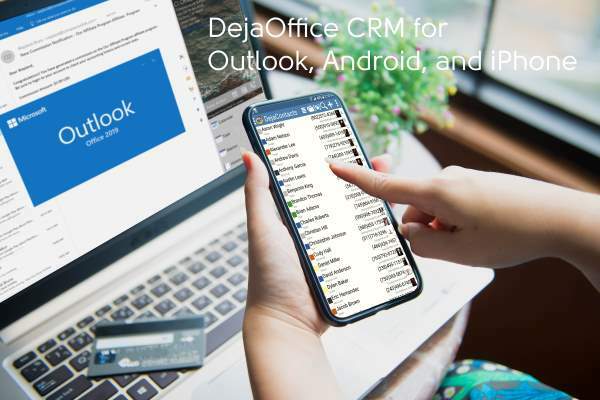 Our new product DejaOffice PC CRM for Outlook adds certain CRM functions to Office 365 Outlook (Outlook 2019). Among these functions are History Also, DejaOffice can import from older CRM systems like Microsoft BCM which was discontinued in 2016. The customer also purchased Premium Support, which is a service where our technician could log into his computer and set everything up. What we did was Sync the old BCM database to DejaCloud. We moved the Accounts, Contacts and Communication History. Then on the new computer, the customer installed DejaOffice PC CRM for Outlook. In addition, the customer uses a Mobile Phone and DejaOffice has the complete database there also. The entire operation of moving the old database to DejaCloud, and sync to the new PC took our technician about 30 minutes. Most of this time was checking the data each step of the way. The actual sync time was about five minutes for both sync phases. Now, the customer can make a new contact from an Outlook email. When they look up a Contacts, they an see the communications history imported from the old PC. And they have Caller ID and History on their Phone. Here is a link to order this same service – DejaOffice PC CRM for Outlook along with Premium installation and one year of support. Give us a call at (503)243-3400 to schedule an installation or talk about your needs. CompanionLink can sync Outlook 2007 Business Contact Manager data with BlackBerry, iPhone, Palm Pre, Google, Windows Mobile and Palm OS phones. 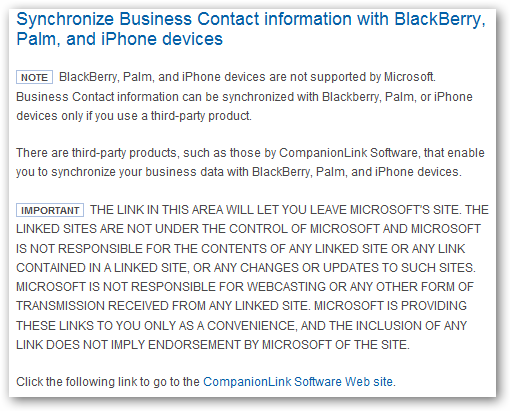 In fact, Microsoft’s help portal mentions CompanionLink as a solution for BCM sync with various devices not supported natively by Microsoft. Get more info about Outlook BCM sync.